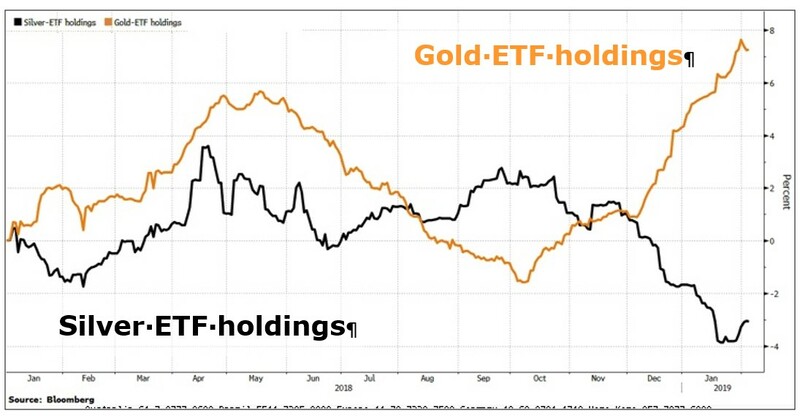 It’s no secret I’m bullish on gold. But there’s something going on with another metal. Something that makes me more bullish on it than I am on gold. The metal I’m talking about? It’s silver! And silver miners? Well, they’re like diamonds in the dustbin at recent prices. 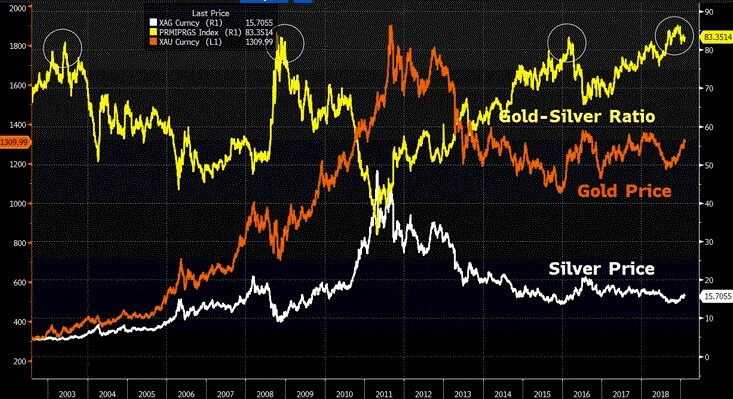 In fact, the gold-to-silver ratio — the price of gold divided by silver — is at a historic high. 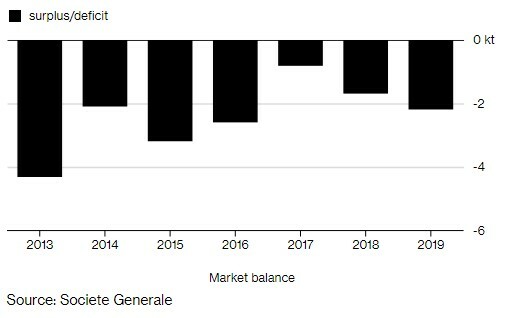 You can see that from this chart I made on my Bloomberg terminal. Now, here’s the thing. When the gold-to-silver ratio approached these highs in the past, it usually ended by silver going higher. This isn’t bad news for gold. Not at all. Gold goes up, too. It’s just that percentage-wise, silver goes up more. Supply Crunch. About 26,000 metric tons of silver should be produced by mines this year. That’s according to estimates by Société Générale SA. That would be the least since 2013. It would also mark the SEVENTH year in a row that silver demand has exceeded supply. Sure, stockpiles can cover excess demand … for a while. But adding to the crunch, scrap silver supply seems to be drying up. scrap silver supply went from 260 million ounces in 2011 to just 138 million ounces in 2017. Industrial Demand is Booming. Silver is a major input in hundreds of products, and not just jewelry and silverware. I’m talking solar cells, computer screens, medicine, chemical reagents and more. In fact, industry accounted for 55% of silver demand last year. That compares to just 10% of gold demand. This is due to silver’s extraordinary conductivity to electricity and heat. And it also has the right stuff for light-sensitivity and fighting bacteria. For example, in 2017 (the most recent data available), silver demand grew 4% year-on-year, due to record growth for the photovoltaic (solar) industry. That’s because most solar panels use silver for their conductivity. Solar panel construction gets more efficient over time — using less silver per panel — but with more and more panels being added, solar demand for silver could be … well … very bright indeed. And wouldn’t you know it: About 100 gigawatts of new solar power capacity is projected to be added per year globally through 2022. Less demand is projected in China, but surging requirements in India should make up the difference. Investor Demand is Red-Hot. Investors are a two-edged sword for silver. When silver is headed lower, investors sell, and that weighs on the metal. But when silver is going higher, investors can’t get enough. And I’m not talking just ETFs. Silver bullion, in both coins and bars, are very popular with many investors who look at that gold-to-silver ratio — the first chart I showed you — and see opportunity all over it. They can see with their own eyes that silver is cheap. And it’s not likely to get cheaper. Recently, the Silver Institute projected that investment demand for silver will rise 5% this year. And a rising hunger for silver among investors in India could throw projections out the window. India imported nearly 225 million ounces of silver last year, up 35% from 2017. Put it all together, and we’re looking at higher silver prices in 2019. How high? Well, silver is consolidating now after putting in a recent high of $16.20. I expect silver to find support, then push back up through that high. Then it could be off to the races to $20 per ounce — and higher. That’s a 27% move from recent prices. Not bad. But silver miners are leveraged to the underlying metal. The move in some of my favorite silver miners could be downright extraordinary. I’m getting ready to pull the trigger on new silver recommendations for Supercycle Investor. If you’re doing this on your own, be very careful and do your due diligence. I don’t have a crystal ball; I don’t know when that will happen. But mine supply is falling and industrial demand is rising. That sure looks like a supply/demand squeeze in the making. And the cycles, which are very powerful in metals, are ready to push silver higher. When the silver squeeze happens, be sure you make the most of it. Buy those diamonds in the dustbin now. They’ll make your portfolio shine later. I also think silver will go to $20 after reading this article! That’s why I own 70,000 EXLLF/Excellon Resources. and the picture will only get better over weeks & months. I this EXLLF will go to $1.20/share !!! You move between metric tons and Troy ounces. How many Troy ounces in a metric ton? Hi Edward, one metric ton represents 32,150.747 troy ounces. And a troy ounce is slightly heavier than a regular ounce by about 2 grams. Sean, please provide a few recommendations as to what silver investments to buy? I get that silver “miners” is probably the best approach, but which one?